Vegas Tech’s own Local Motors, Inc., the world’s leading open-source hardware innovation company, will be part of the first-ever White House Maker Faire, June 18, 2014. 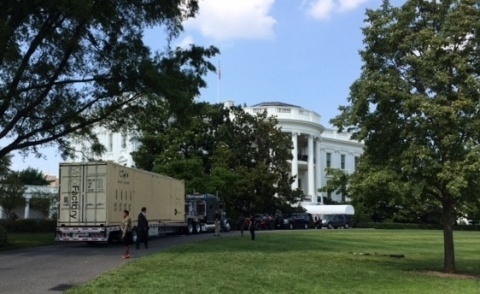 Local Motors will exhibit its Mobifactory at the White House Maker Faire. Essentially a highly customized shipping container, Mobifactories are designed to be easily transported anywhere in the world to demonstrate both the making potential and scalability of Local Motors’ innovative approach to manufacturing. “Local Motors and FirstBuild’s presence at the White House Maker Faire is a great way to build awareness on the importance of corporations working with the maker community and startups so that we can all get better at making things. This open collaboration model is critical to pioneering new manufacturing methods that will help us get innovative products to market faster than ever before,” said Kevin Nolan, VP Technology for GE Appliances. About National Day of Making: To further celebrate a #NationOfMakers, Local Motors will host a special Day of Making event at their open-to-the-public LM Labs facility in Chandler, Arizona. Learn more about the Local Motors open Arduino Build Night at the Local Motors blog, and visit www.whitehouse.gov/makerfaire for more about the White House Maker Faire and other national Day of Making events. About Local Motors: From bytes-to-bits, the Local Motors platform empowers anyone to design, build, and sell the world’s coolest machines. The platform combines global co-creation and local micro-manufacturing to bring hardware innovations to market at unprecedented speed. The Company stewards a global co-creation community made up of hobbyist innovators and professionals. This community is comprised of enthusiasts, designers, engineers, and makers. The Company operates a growing global network of microfactories, where innovators create amazing products and consumers come to marvel and shop. We make the coolest machines together. Makers can learn more and join the Local Motors community at localmotors.com, and connect with us at facebook.com/localmotors or by following us on Twitter@localmotors.